It looks like our most recent Open Telephony Training Seminar at Digium’s Headquarters was a success beyond our wildest dreams! Digium was so impressed with FreePBX, our community (as represented by the class attendees), the great attitude of everyone (who else has participants set up camp with their RV in the Digium parking lot), and the project as a whole that they went off and created AstriskNOWTMwhile I was on the plane returning from Huntsville! I must admit the announcement was not a complete surprise, having used our captive audience last week as a test bed for the new AsteriskNOW distribution which went very smoothly. If you are looking for a clean ISO with out a lot of extra fluff, this is an excellent option to consider. Although it is still in beta with a few minor known issues that are being addressed, I expect it to come out strong. 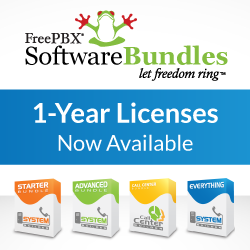 If you couldn’t attend this last opportunity or want to be one of the first to come to the next AsteriskNOW/FreePBX training, then sign up early while we are still offering an un-advertised EARLYBIRD discount of $300 until the end of this month.